This post contains affiliate links. Using these links does not cost you any extra, but helps fuel our blog - Thank you! How many of us struggle with our regularity, especially during the holidays? I know I am not the only one, because I have the distinction amongst my friends of being the lady who gets to hear all the poop stories. Why? Probably because I've been studying nutrition for years, or maybe because I'm one of the few people I know who is consistently regular most of the year. I never understood why people had magazines in their bathrooms when I was growing up - why would anyone spend that much time in there? Then I hit adulthood, and the uncomfortable realization came that most of the people I knew were NOT regular. What is a good definition of regular? It follows the 3-3-3 rule: you should go poo no more than 3 times a day, and no less than once every three days, and it should take you three minutes or less to go. To find out what your poo should look like, check out this handy chart from Dr. Poo. In case you had not noticed, I'm not afraid to talk about good gut health, because I have been convinced for years that a healthy gut leads to a healthier body. When I met the people at Regular Girl I knew I had found some kindred spirits. They're not afraid to talk about gut health, poo, regularity, or clinical research. They want you to get regular, and stay that way. I always try to add some extra probiotics to my regime when the holidays come around, because I want to stay healthy. 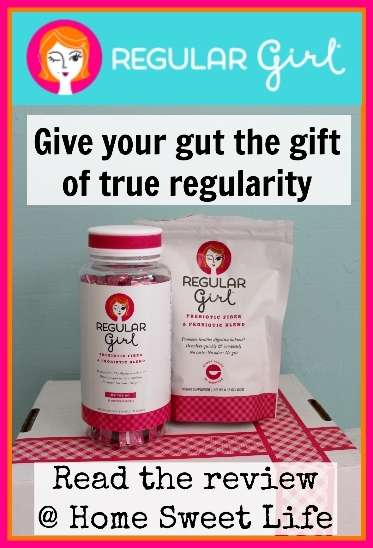 I was interested in trying Regular Girl for myself because I've tried several other fiber products out there in the market today, and I've found that many of them are either really clumpy and taste gross, or they are unrealistically expensive for everyday use. 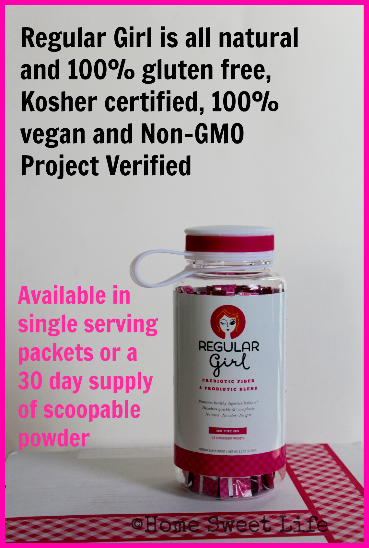 Regular girl solves both of those problems by having a clinically researched soluble dietary fiber that dissolves quickly and completely. I was pleasantly surprised to find that Regular Girl really did dissolve well, and that it had no taste, and no aftertaste. Please tell me I am not the only one who has struggled to swallow the last of that grit in the bottom of the glass from other fiber products?! Regular Girl comes in both convenient single serving packets, and in a 30 day pouch of scoopable fiber. I prefer the pouch for everyday use, as I can add it to my morning smoothie or a non-carbonated drink (like juice or cooled herbal tea) but I am sure I will appreciate the single serve packets more next Spring when I begin traveling again. Has anyone else ever noticed how the simple act of traveling, even when you eat the same as at home, can really do a number on your digestive flow? Yeah, no one wants to be constipated while camping or flying! Regular girl can be used for ongoing regularity, or for intermittent use. I am quite happy with the results of my daily consumption of Regular Girl. What I like even more is that while it is marketed for women, it can be used with children as young as nine months, and men as well. Ladies - if your husband is hogging the bathroom for all the wrong reasons - start giving him a daily dose of Regular Girl in his morning juice or smoothie before he heads out the door. You, and his co-workers, will be glad you did! I received a free sample of this product in exchange for my honest review. I was not required to write a positive review, nor was I compensated in any other way. All opinions are mine or this of my family. I am disclosing this in accordance with FTC regulations.